I’ve released a new version of gmail-crypt, my extension that allows OpenPGP/GPG encryption in Gmail through a Chrome extension. 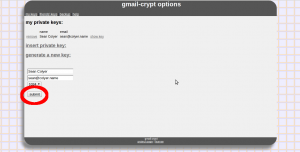 The biggest change in this version of gmail-crypt is the addition of key generation. This is a VERY EARLY stage key generation, the key ID’s are not calculated the same way as GPG, I’m currently not sure what the issue is. This means that it’s possible you’ll have to regenerate your key in the future! The installation process is basically the same as the old version. Click Here for the extension. Test it out by sending yourself an email in gmail and click the “encrypt me” lock icon, when receiving the message click “decrypt me” by the unlock icon. Get your friend to install the extension and see if you can send messages. NOTE: as indicated above, these keys may have to be regenerated in the future. Hope this can help someone! Let me know other ideas you might have..